The Yellow-crowned Euphonias (Euphonia luteicapilla) are Central American finches that are found in Costa Rica, Nicaragua and Panama. 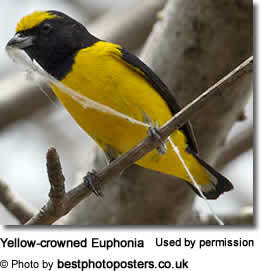 This is likely the most common euphonia in its range. They range in length from 3.4 - 3.8 inches or 86 - 96 mm and weigh around 13 or 14 grams. The bill is relatively small; it has a broad shape that gradually tapers to a point. Halfway down the beak there is a slight bend downwards. The male's entire crown and most of his underparts are bright yellow. The throat and rest of its upper parts are steel blue. Both the male and female build a covered nest with a side entrance. A clutch usually consists of 3 eggs, but 2 to 4 eggs a clutch are possible. Only the female incubates the eggs. The young hatch after about 13 or 14 days. Both parents feed the chicks with regurgitated matter. The young fledge (leave the nest) when they are about 22 to 24 days old. Their diet consists of a variety of tree-borne fruits. In particular, they are known to feed on mistletoe berries. Their gut is specially adapted for mistletoe berries, which are poisonous. These finches tend to move to places where mistletoe berries are the most abundant. They are most commonly seen in small groups foraging in their favored feeding areas. Euphonias are known for their almost constant singing. Their best known calls sound like "Pe-we," "see-see," and "beem-beem" - hence their local name, Bim-Bim. Please Note: The articles or images on this page are the sole property of the authors or photographers. Please contact them directly with respect to any copyright or licensing questions. Thank you. Crows: The birds that go fishing with breadcrumbs! The Smallest Bird on Earth Weighs Less than a Penny! Please note: Any content published on this site is commentary or opinion, and is protected under Free Speech. It is only provided for educational and entertainment purposes, and is in no way intended as a substitute for professional advice. Avianweb / BeautyOfBirds or any of their authors / publishers assume no responsibility for the use or misuse of any of the published material. Your use of this website indicates your agreement to these terms.